© 2006-2019 Rogers Media. All rights reserved. [Waterloo, Ontario – ] It just recently became difficult for Denise Seitz to walk because of Arthritis and Fibromyalgia. For now, she is paying for all medication and phsyiotherapy out of pocket until she gets disability approved by the government -- which will take months. 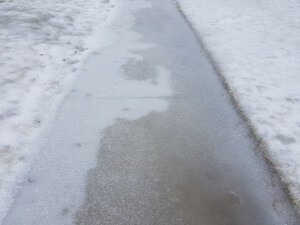 Seitz says she has already reached out to community services and charity organizations for help with her sidewalk, but nobody has been able to help. "I've contacted The Working Centre numerous times, leaving messages asking for snow clearing, which would be a cost to me, but they have not returned my phone call. I have also reached out to our MP and our MPP to expedite my disability applications." Seitz says every dollar she has goes to medication and treatment. As she continues to wait for disability approval without a job, she says the last thing she can afford right now is to pay for snow removal.